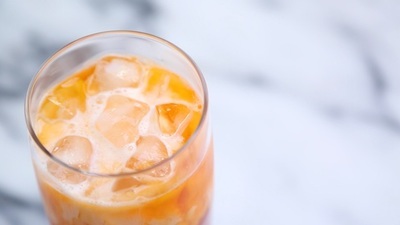 • Authentic Thai Iced Tea Drink Recipe (using Teabags)! Do you love Thai Iced Tea? Every once in a while I get a craving for Thai Iced Tea, and sometimes it's nice to be able to make your own at home. I was so excited to find a box of Thai Iced Tea Teabags, (yes! they make them in teabags!) that are individually wrapped and taste just like the Restaurants serve. The great thing about this recipe, is you can control the amount of sweetener and caffeine as sometimes I find that the restaurants' tea is brewed a bit too strong and a tad too sweet. 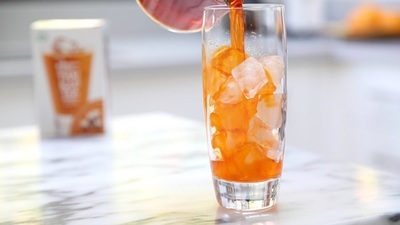 However you like your tea, this iced drink recipe will be refreshing for the upcoming summer months. Did you know? All Authentic Thai Iced Teas are actually a blend of spices and flavorings (like vanilla) and they contain food coloring to get that signature bright orange color.